A couch or sofa is a major furniture investment, and one you may live with for decades, so it's important to make a good decision. Style preferences are a personal matter, but when it comes to choosing a good-quality sofa, there are objective criteria you can use to ensure you're getting a sofa you can be happy with for many years. 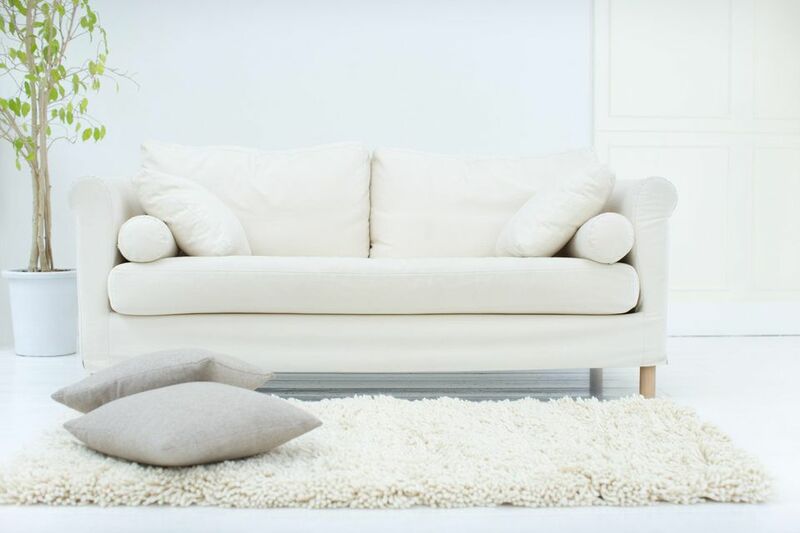 When you are shopping for a new couch, follow these 11 tips to ensure a great purchase. There is no sense in considering a couch if it doesn't fit you well. Seats should be comfortable for all members of your family. If you're buying a recliner sofa, make sure it is comfortable in all the different positions. The primary fit consideration is the depth of the seats. Select deep or shallow seats, depending on your height—the couch back should support your back adequately with your feet flat on the floor and the backs of your knees just slightly forward of the lower seat cushion. And if the couch is where you like to nap, make sure to lay out on the couch and see if it is long enough for comfortable snoozing. Upholstery fabric and cushions can be replaced when they get old and worn, but no couch can be considered a good piece of furniture unless it has a solid, quality inner frame. If your goal is to buy a good sofa, start by learning about the frame. Cheaper sofas may have frames made from particleboard, plastic, or metal, but a good-quality couch will have a solid hardwood frame—preferably a "kiln-dried" hardwood frame made of oak, beach, or ash. Pine frames are cheap, but they often begin to warp and wobble within five years or so. The legs of the couch should be either integral parts of the frame or held on with screws or dowels. Avoid a couch if the legs are merely glued on. One easy test for solid frame construction is to lift one front corner or leg of the sofa off the floor to a height of 6 inches or so. If the other front leg doesn't quickly rise off the floor, too, it's a sign the frame is twisting, and is therefore weak. Any sofa that visibly twists or creaks under this test is one you should avoid. Although the method by which the frame parts are held together may not be immediately evident, the sales person or printed technical specifications should have this information. Look for frames that are joined with wooden dowels, double wooden dowels, wooden corner blocks, or metal screws and brackets. Never buy a sofa that is assembled with only staples, nails, or glue, although these may be used to provide additional reinforcement. A sofa with a good hardwood frame assembled with dowels or corner brackets should be quality piece of furniture, but it is still a good idea to forcefully test the arms of the sofa to make sure they are very tight, with no give when you lean on them. In a family with active children, the most common area of failure on a couch (other than the upholstery) is the arms. As you test the couch, push hard on the arms and look for any sign of wobble. Avoid any couch that isn't rock-solid. The springs that hold up the cushions on a couch come in three levels of quality. Least expensive (and least durable) are those that aren't springs at all, but just webbing or mesh. Avoid these couches if your goal is a quality piece of furniture. Most couches use what is known as serpentine springs—sinuous pieces of snaking wire that span the gap between frame members. These offer good support, but they may sag over time if the metal isn't heavy-gauge. Luxury sofas are fitted with what is known as "eight-way hand-tied springs," which are very comfortable but also expensive. Some experts dispute if hand-tied springs are any more comfortable than good serpentine springs, but you can be the judge of that. Feel the springs through the upholstery. Good springs will be quite firm and spaced close together for good support. There should be good support without too much give when you sit on the couch. The frame and all the corners of the couch should be well padded. Run your hand over all corners to make sure you can't feel the edges of the frame through the upholstery. If you can, the upholstery may wear through quite quickly, and your couch will not be very comfortable to use. If your couch is a recliner or sleeper, make sure to operate the mechanism repeatedly and aggressively to make sure it operates smoothly and easily. Reclining, or motion furniture is generally more expensive, and you are paying for a functioning, smoothly-running mechanism. Don't overlook any mechanical glitches or rough operation you notice—these will only become more pronounced after repeated use in your home. Quality upholstery may not be critical to the sitting comfort of your sofa, but it is critical to its visual appeal. Just as in well-tailored clothing, patterns and stripes should match at the seams. Although it might not catch your eye right away, mismatched patterns or stripes will give you the sense that something is "off". Stripes that match at the seams make a sofa look well finished. Patterns should be centered, and all seams and welts should run straight. Uneven welting and seams that are pulled to one side or another mean that the cover was badly tailored. With fabric upholstery, higher thread counts indicate a denser weave and more durable fabric. If there are any buttons, check to see that they are sewn on securely. Loose buttons will come off and quickly get lost. Seat cushions should be firm and resilient and fit snugly within the sofa frame. The cushions should regain their shape after you press down and let go. A cushion that stays put when you press down will be flattened in no time, end up looking unsightly and feel uncomfortable when you sit on it. Cushions that do not fit snugly will also lose their shape quickly and the edges will start looking unsightly. There is considerable debate over which type of material is best for sofa cushions. Polyurethane foam is the most common material used, but it is important to find a balance between a firm foam that is long-lasting but may be too hard, and a soft foam that is comfortable but may break down too quickly. High-resilient (HR) foam is a step up, making for comfortable and long-lasting cushion. Very expensive couches often use goose down mixed with feathers, but you will pay dearly for this luxury, and the cushions will need to be plumped frequently. A hybrid type of cushion that some experts recommend is HR foam wrapped in down-and-feathers, which combines the best of durability and comfort. For fire safety reasons, look for the gold UFAC tag, indicating that the sofa manufacturer certifies that it has been made in accordance with UFAC methods. UFAC—the Upholstered Furniture Action Council—was founded in 1978 with the purpose of making upholstered furniture more resistant to ignition from smoldering cigarettes. UFAC claims that the number of household fires has gone down considerably since these standards were put in place. More than one sofa has been returned to the store because the delivery service could not get it through the doorway. Many couches have legs that can be unscrewed and removed to make delivery easier, and in some cases a door can be removed from its hinges to enlarge the opening enough to squeeze in a large couch. Measure the height, width, and diagonal opening of all doorways in your house, and have these numbers on hand as you shop for your sofa.